56" x 48" x 50"
Head: 56" x 48" x 50"
Male Figure: 22" x 29" x 79"
Female Figure: 29" x 24" x 29"
("Stroller" was on the cover of ART NEWS. 40.5" x 34" x 26"
Nina Levy models her sculpture from observation and then introduces a distortion, alteration in scale, or fragmentation, they do not involve life casting. 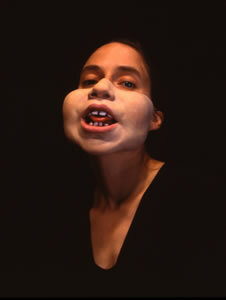 Previously, Levy took herself as the point of departure in her work using her own body as source material. 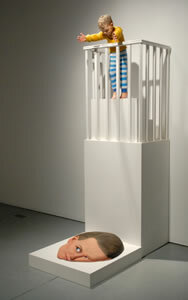 In her recent work, she has shifted the focus to her family and the psychological complexities of parenting. Nina Levy's fujiflex photographic prints present herself interacting with sculptural prostheses. Unlike so much contemporary photography, these photographic images are not digitally manipulated. Close inspection reveals that the disjunctive body parts are in fact real, three-dimensional objects that are sculpted out of resin or plaster. The odd combinations and scale disjunctions create a dream like logic. As with her tour de force sculptures these works also explore the role of the individual ego in relation to the empirical demands of family. Nina Levy has exhibited widely in the United States. 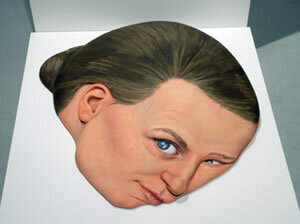 In 2003 metaphor contemporary art premiered the exhibit of her widely acclaimed portrait series of sculpted art world heads titled ?Other People?s Heads?. 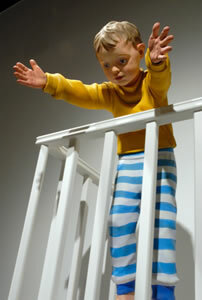 Reviewed in both Art in America and Sculpture Magazines these were subsequently exhibited at the Aldrich Museum, Ridgefield, Connecticut, the Brooklyn Museum, Brooklyn, NY, and the National Portrait Gallery, Washington, D.C. in 2006. Additionally Levy has exhibited at the Neuberger, and DeCordova Museums, and made site-specific outdoor installations at the Aldrich Museum and the MCA in San Diego. Current shows include an individual project at the reopening of the National Portrait Gallery in D.C. in 2006 and a reprisal of her Family Resemblance exhibit premiered at metaphor at Real Art Ways in CT. Her work has been featured in numerous publications. 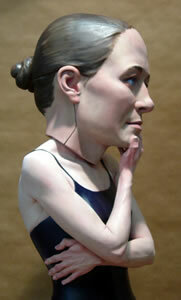 An extensive interview with Levy was published in the November 2005 issue of Sculpture Magazine. 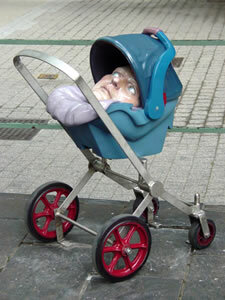 A detail of her sculpture ?Stroller? 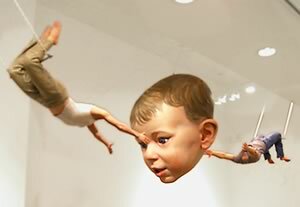 2004, was used for the cover of the December 2004 issue of ARTnews illustrating their cover story on new figurative sculpture. Additionally Levy has had reviews and articles in The Washington Post, the New Yorker, the New York Times, Art in America, the New York Observer, TimeOut NY, the New York Sun, the Boston Globe, the Chicago Sun-Times, the New Art Examiner, and many other publications. Nina Levy received her BA from Yale in 1989, and her MFA from University of Chicago in 1993. 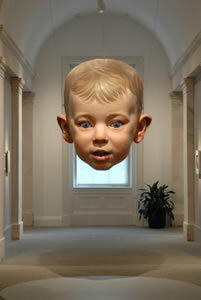 Toddler: 24" x 21" x 14"
Head on Floor: 6.5" x 29" x 29.5"
lifesize 46.5" x 23" x 21"